CINCINNATI -- High-quality day care that starts in infancy and parent counseling pay big dividends well into adulthood for children from low-income families, according to a Nobel laureate's study released today. While Greater Cincinnati has invested more in similar programs than many metropolitan areas, only a fraction of eligible children are being reached. "All the 0-5 work has been woefully under-funded, and if we want to see major changes in how are children are doing, those investments or lack thereof have to be priority No. 1," said Greg Landsman, strategic advisor to the Cincinnati Preschool Promise. The study , led by University of Chicago economist James Heckman, tracked people who participated in early childhood programs starting eight weeks old beginning in the 1970s, and followed them until age 35. Children from low-income, mostly black families in the Chapel Hill/Durham, North Carolina area were offered high-quality day care and preschools, and parents were given professional guidance. The study found that the 35-year-olds, on average, had fewer health problems like diabetes and high blood pressure; made more money; committed fewer crimes; and had higher IQs than peers who did not have the same high-quality early care. "Costs are substantial, as has frequently been noted by critics. But so are the benefits, which far outweigh the costs," the study concluded. Heckman and his colleagues found that the money invested in the early childhood programs had an annual return of 13 percent -- far better than investing in the stock market, for example -- in terms of lower costs of incarceration and health care as well as people working in higher-paying jobs and contributing more taxes back to their communities. "This program promotes well-being of the children but also engages mothers in the workplace. It provides a two-generation advantage," Heckman said in a conference call with reporters. Put another way, every dollar invested in newborns returns $6.30, Heckman said. One eyebrow-raising aspect of the study was the effect of high-quality day care on boys. While all children suffered from participating in low-quality daycare, boys entered kindergarten far less ready to learn as a result, the study found. But boys stand to gain the most from high-quality day care, the researchers found. "Boys seem to be less resilient to having their mother removed (from daytime care) and being placed into a low-quality daycare arrangement," Heckman said. Heckman said most gains in a child's IQ will be determined by age 3. While high-quality preschool can provide tremendous benefits, it's been shown to do little to improve a child's IQ, he said. "Most of the growth in IQ in terms of cognitive skills has taken place by age 3," he said. "It's more intensive and costly to start at an early age, but many benefits are actually gained." So how are we doing in the Tri-State? Every Child Succeeds in action. Courtesy of ECS. Preschool-aged children who live within the Cincinnati Public Schools district will see a leap in access to quality preschools beginning in fall 2017 thanks to the November passage of a school levy that will pump $15 million into subsidizing public and private preschool. Care for infants through 3 is a patchwork of services led by United Way of Greater Cincinnati and its Success by 6 program and support of other programs. "As it stands, none of the programs are reaching all eligible children in the region," Stephanie Byrd, Success by 6 executive director, said. A lack of funding is the primary culprit, followed by parents declining to participate, she said. Among 566 daycare and preschool centers in areas that United Way of Greater Cincinnati serves in Ohio, just 52 percent are quality rated and only 40 percent earn three or more stars on the state's five-star scale, according to Byrd. "Most rely heavily on private/donor funds, and they serve the children they can reach with existing funds," she said. "Programs like (Every Child Succeeds) receive state and federal funds, which often don’t cover costs." Every Child Succeeds conducts home visits to pregnant women and follows up with the family through the child's third birthday. Judith Van Ginkel, ECS president, said her organization meets 20 percent of the need. She said 85 percent of a child's core brain structure is developed by 3, but that less than 4 percent of education funding is invested in children those ages. "Dr. Heckman is one of the important people in our field and he consistently reports that the major investment in childhood comes too late. We agree with him and maintain that it needs to begin with children 0-3 when the brain is developing most exuberantly," she said. Kevin Osborne, spokesman for the Cincinnati-Hamilton County Community Action Agency, said his organization serves 252 infants, toddlers and pregnant women and partners with other providers to serve another 152 infants and toddlers. "What we know is that in (Hamilton County) there are about 9,000 infants and toddlers that are low-income. We are only serving a small percentage due to funding and space," he said. Home Instruction for Parents of Preschool Youngsters, or HIPPY , works directly with parents of children ages 3-5 in Hamilton, Clermont and Brown counties. 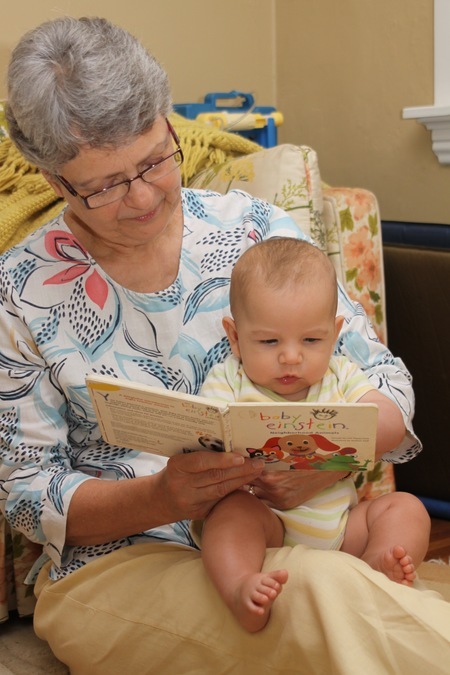 Through regular home visitations, HIPPY counselors provide parents with a set of curriculum, books and materials designed to strengthen their children's cognitive skills, early literacy skills, social/emotional and physical development. As a result, 90 percent of children whose parents participated were deemed kindergarten-ready using the Bracken test, including 44 percent who were advanced or very advanced. Eileen Hopkins, who oversees the Greater Cincinnati HIPPY program, said her group uses limited funds to target families who feed into schools that have had large numbers of children who weren't ready for kindergarten. "I think there's a really large percentage of the population we're not touching," she said. Hopkins is optimistic that Cincinnati's Preschool Promise effort will bolster prospects for children living in the CPS district, but she said the need extends throughout the Tri-State for more high-quality preschool and daycare. "I know it's a hard sell, but that's what the research indicates. It's about return on investment. Other children in other areas of our region also need this leg up," she said.